This Piedmont-inspired gelato boutique has a cute boudoir vibe, thanks to curlicue chairs and vintage painted dressers lined with Italian goodies. 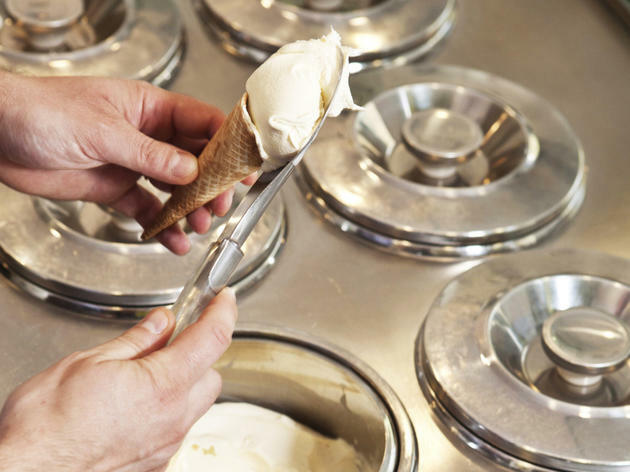 Gelatorino’s ice-cream display isn’t as tempting as some, because the ices are scooped straight from pozzetti (lidded steel tubs set in the counter), which is arguably the best way to keep high-quality, preservative-free gelato fresh. Specials such as fig ripple add flair to the mostly traditional selection, all of which is made on site. Coffee-flavoured ‘Breakfast in Turin’ is a worthy signature gelato; dark chocolate and gianduja (hazelnut and chocolate) were spot-on renditions too, but our caramel panna cotta gelato tasted merely sweet. Baked goods include tiramisu muffins, and you can order special-occasion gelato cakes. We like the friendly, professional service and handy central location. While the coffee is ordinary, hot chocolate made with melted gianduja keeps customers popping in on cooler days. My father is from Turin and I have to say that Gelatorino is worth a try. The taste and texture of the ice cream is very good and although there is not a great variety of flavours Gelatorino is true to Piedmont tradtion with typical flavours such as giandja and bunet although I wasn't able to taste nougat which was advertised on their website. The flavour of the month "Pumpkin Pie" was lovely and made my day. I was a little disappointed by the choice of baked goods in the shop. They were not typical of PIedmont and you could also get a Panettone from Milan which I don't think makes sense with the overall philosophy of the place. So delicious, I wish there were more places like this! Super tasty gelatos! My fav is the pistachio. There was a queue out the door when we went for some pre theatre ice cream - not because it was uber popular, just because the staff were uber slow. However the ice cream was delicious! I enjoyed being able to have two flavours in a small cone, and all the ones we tried were very good - particularly the pistachio. Pricey, but for the location and quality I'd say it was worth it. Some friends and I happened upon this spot after being turned off by a super busy bar we had tried to get into. Well believe you me, the next best thing to booze is probably ice cream. Or gelato. (I'm still not sure if we had gelato. Probably.) Anywho. I had the gianduja and chocolate which was fantastic. Great flavour and texture, and the value for money was surprisingly good considering the location (Covent Garden). My friends were also happy with their choices (pistachio milkshakes). I'd definitely go back - there were so many flavours I wanted to sample!!! Fantastic ice cream and knowledgeable staff. Rum ice cream is delightful find and fig surprise simply delicious. Stands out from the rest! Definitely the best gelato in the city. Creamy and smooth, plus they make it right there in the store! I personally recommend a mix of hazelnut chocolate and pistachio. I came here for the Breakfast in Turin flavoured gelato, as it was listed in Timeout as one of the top ten ice creams in the city. I didn't think it lived up to that title. It was more icy than creamy and was quite a small portion for the price. Definitely the best ice cream in London! The décor is amazing, the service is amazing too and o m g the passion fruit! Not from Italy but have been to Italy and this is certainly the best!!!!! Obvs its not Italian gelato in Italy but its the best in England for sure! Will be taking all of my friends here- watch out! I'm Italian and I LOVE gelato. I've tried many gelaterias here in London and so far this is THE BEST one. The flavours are quite classic and the taste and texture are absolutely genuine. 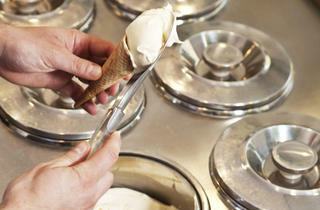 The gelato is not too creamy as it is in the majority of the ice-creams shops around town. I don't like chocolate, but I die for their melted gianduja, especially in the cone and on top of it. The reason I love gelato so much is that makes me happy and at the Gelatorino also the guys have this effect on me. They're very friendly, very Italian and always happy to have a chat. This is one of the best Gelato parlours in London. I just wish there would open more around London!! strongly recommend! most delicious ice cream I have ever eat! Not bad but definitely not made entirely there, the hazelnut is good but they have to work a lot on the other flavours, sometimes they are icy some others they lack of taste. J.
I'm Italian and Gelato lover. Gelatorino could be a very good Gelateria in Italy too. The best Gelato in London for sure.